After a few ‘Questions Candidates Ask In Interviews’ themed articles appeared in my Twitter stream, I was reminded of an article I wrote two years ago called ‘Best Questions To Ask The Interviewer, And When To Ask Them‘. I think one key element missing in the new articles is the ‘when to ask them’ detail that I feel is incredibly important. 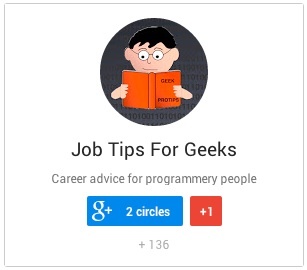 Also, being that JobTipsForGeeks is aimed at technology professionals, there are some nuances that do not apply to other industries. Why is the timing of when the questions are asked important? An interview is nothing more than a blind date, with the goal on both sides being to find out if you want to start seeing each other in a somewhat committed fashion. You want to discover as much as you can about the other party, but first you have to set a positive tone and build trust. We surely would want to find out if our blind date is, say, a serial killer – but leading off with the ‘Are you a serial killer?’ question would seem rude, and we probably wouldn’t get an honest answer anyway. Below is a list of the best questions to ask in chronological order. Please keep in mind that you would need to restart from the beginning for every new person that you meet in situations where you meet with multiple participants individually. You may not be afforded the opportunity to ask all the questions based on time constraints, so use at least one question from the first section for each person and try to use all the questions at least once at some point in the process. Reason to ask it: Most people genuinely like to talk about themselves (those that do not share this trait will probably not be in the interview), so give them a chance to do so. Don’t be afraid to toss in some remarks and perhaps a follow-up question regarding their background if appropriate. You may learn that you have some shared history with this person that could give you a potential ‘in’. Reason to ask it: This question serves two purposes. First, it gives the employee the opportunity to speak well of the company, which again will give an initial positive vibe to your dialogue. Secondly, what the employee chooses to say they like best can be quite telling. If their answer is ‘environment’, ‘work/life balance’ or ‘the people’, that is a universal positive. If the response is ‘the money’ or ‘vacation time’, you may want to dig deeper to find out why. Reason to ask it: This shows that you have done your homework before the interview and that you want to be taken seriously as a candidate. This is something that you want to fully research to prevent making a huge mistake that would make recovery impossible. Question: What are the biggest challenges you face? Reason to ask it: The reason for using the word ‘challenges’ is that it does not have a negative connotation, whereas asking someone for the ‘worst’ element of their job will not give a positive impression. The answer here will start to create an image of what this company is going through today and what the landscape is for tomorrow. At a start-up, you may hear answers about financial challenges, limited resources and a fast pace. Some industries are known for heavy regulation getting in the way of progress. This is all valuable information. Question: What would the typical day be like for me at COMPANY? Reason to ask it: You may get an answer that gives you tangible insight into work/life balance (‘I usually get home in time to watch Jimmy Fallon’), how much of your day may be spent coding or doing other duties, how many meetings you may be pulled into, etc. Question: What was your career path here and what is a typical career path for my role at COMPANY? Reason to ask it: Find out if they promote from within and if there are separate technical and non-technical/pure management tracks. Will you be forced into a management role? Question: How would you describe the environment? Reason to ask it: Asking an open-ended question like this could lead in several directions. You should be able to ascertain if it is cut-throat or cooperative, how much support is given to technologists, and whether you will be expected to work with teams or as a solo entity. Question: Management styles? Development processes and methodologies in place? Reason to ask it: Engineers preferences for structure vary greatly. Be sure to drill down to get the best understanding of whether their practices are aligned with your views. Reason to ask it: If their answer is a list of products and technologies that are severely dated, it could mean the company doesn’t invest in or even investigate the latest and greatest. Conversely, if they seem overly concerned with bleeding-edge, perhaps they are making tech decisions based on cool factor more than quality. Be sure to listen for what can be telling patterns, such as an abundance of tools from a particular vendor or a wide variety of open source tools. This question also gives you an opening to discuss your experience (and preferences) relevant to their stack. Question: Why is this position open? Reason to ask it: Growth or promotion are the two most desirable answers. Perhaps this position is a launching board into higher level positions, or maybe it is a dead-end that will burn you out. Question: What qualities/background do you think would be key to making someone successful in this position? Question: What projects are just getting ramped up or are on the horizon? Reason to ask it: Interviewers will enjoy discussing new endeavors that they think you will find most interesting. If they talk about fixing bugs and maintenance, chances are that is what you will be doing in this job for the foreseeable future. Ideally, the interviewer’s excitement should be palpable. Question: Where do you see yourself in five years here at COMPANY? Reason to ask it: This question is generally asked of candidates, so turning that around should provide insight into how he/she really feels about the firm and their prospects. Again, it lets the interviewer talk about himself/herself again in a positive fashion, and if the interviewer has a sense of humor expect an attempt to use it on this question. Question: Is there anything else I can answer for you or any more information I can provide to help you in your decision? Reason to ask it: It shows you are forthcoming and trying to be helpful. Question: I am very interested in this opportunity (or similar sentiment). When do you expect COMPANY might be making a decision? Reason to ask it: Showing interest is vital, and asking about their timing could lead to information on other candidates. It also may prompt them to ask about your availability to start, which is an obvious buying sign. You want to do this is with as little pressure as possible. Close by thanking the interviewer for taking the time to speak with you and tell him/her that you look forward to the next steps. Good luck.